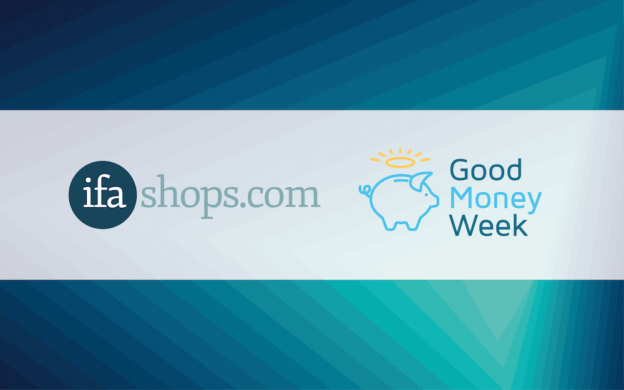 IFA Shops is delighted to announce the partnering with Good Money Week for it’s event at the beginning of October, later in the year. The event is run by the UK Sustainable Investment Finance Association, with the aim to help grow and raise awareness of sustainable, responsible and ethical finance. The week of events, which will run 29th September – 5th October 2018, is aimed at financial advisers, financial institutions and charities. They particularly endeavour to demonstrate the sustainable and ethical options when it comes to finances, so we can all a positive impact on the environment and society without sacrificing wealth. If you would be interested in attending any of the events at Good Money Week, follow http://goodmoneyweek.com/whats-on for more details. GMW has already announced some events, including ‘Screened, Themed and Engaged 2018 – Exploring Sustainability & Suitability’, intended to cover ‘What does ‘sustainable and suitable’ mean to us’ as well as a market update from UKSIF. The event is well supported by the SRI, ‘Sustainable and Responsible Investment’, whose ‘mission is to help change the way people invest by making it easier to bring ethical, social and environmental considerations into investment planning’. We will continue to share information on the events of Good Money Week as the event comes closer. This entry was posted in Views on 10th September 2018 by admin.